Neuropathy is a common term assigned to general malfunctioning of neurons. It is primarily associated with random damage to neurons of any locations in the body, due to injury or disease. The condition is further classified into different types of neuropathies, depending upon types and location of the affected nerves. The underlying cause of neuropathy or neuronal damage is identified due to various health issues like different diseases such as diabetes, injuries, infections and multiple vitamin deficiencies. Besides intake of toxins for a longer period of time, medications, trauma, tumors, etc. are also identified to be some of the reasons for neuronal damage. In this type of neuropathy, nerves that are part of the peripheral nervous system are affected and damaged. These nerves are generally present outside the brain and in the spinal cord, causing functional damage to the lower extremities, like toes, feet, etc. These types of neuropathy cause damage to any of the twelve cranial nerves that are directly originated from the brain. It has been further segmented into optic neuropathy and auditory neuropathy. Optic nerve refers to the damaged or diseased optic nerve, whereas auditory neuropathy has a direct connection with hearing loss. Autonomic Neuropathy is associated with damaged nerves of the involuntary system. These nerves primarily control involuntary muscles, like beating of the heart, circulation, muscular contraction, digestion, sexual response etc. Whatever may be the cause, neuropathy is associated with multiple symptoms, some are characteristics and other are highly non significant. Such highly variable symptomatic expression depends upon degree of neuronal damage and age of damage. Currently available medical interventions mainly involve treating the cause of concern, such as diabetes, autoimmune disorders, kidney damage etc. In many patients only steroidal medications are offered to attain symptomatic relief. However, no available treatments have been so far noted to reverse the damage and diversify the root cause of concern. Today, stem cell therapy is considered to be a part of modern regenerative medicine, which definitely has a solution. Stem cells are body’s integral healers, which can maneuver damaging conditions and cellular loss by producing new cellular system. Studies have identified these stem cells to be potent enough to differentiate into multiple lineage specific cells, in order to add on to functional restoration of specified organs. Thus, amongst most of the available disease modifying treatments that can only target rehabilitation and not the underlying cause of concern; stem cell therapy can offer tremendous hope in addressing the challenges in disease reversals and stop its progression. Through our advanced technology it is now possible to isolate stem cells from two of the richest sources of our body, such as adipose tissue and bone marrow. These stem cells when infused into the cerebrospinal fluid through intrathecal administration can differentiate into cells of neuronal lineage in order to restore the lost brain function. We have mastered the technology for isolating maximum number of viable stem cells from either the autologous sources of your own body or allogenically with the healthy donor to treat various forms of Neuropathy. Once infused back in the body, these cells can reach at the targeted site through their strong paracrine effects and differentiate into lost neurons or help revive the damaged ones to restore their function back. 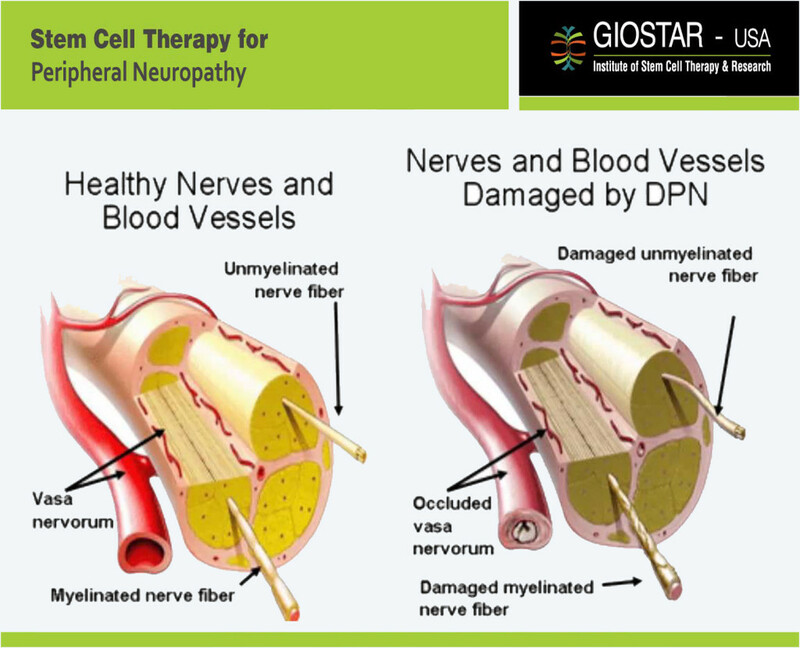 GIOSTAR has developed the technology to generate the functional neural cells from Stem cells which has ability to repair the damage neural cells may cure the patient.